Looking for a new game that’s a bit more challenging than the average lot? 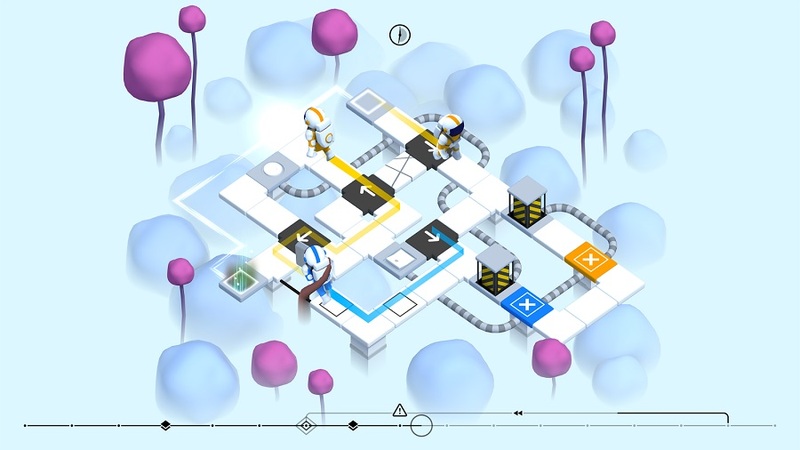 Well if you like puzzle games, we might just have the thing for you. Most of us prefer a game we can pick up anytime, play a few minutes with and then return to whatever we were doing before. Well, the game we’re going to talk about is not part of the casual games category. No, you’ll be spending quite some time trying to understand the mechanisms behind the game and attempting to solve the levels. So are you prepared for an intense mental workout? Then head on to the Google Play Store and download Casualty. Casualty is not free to download, so you’ll have to pay $1.99 if you want to give this puzzle game a try. The good news is that the game is not riddled with annoying ads which pop up randomly when you least expect it. What’s more, there are no in-app purchases either. As soon as you install the game on your Android smartphone or tablet, you’ll be thrown into the action. 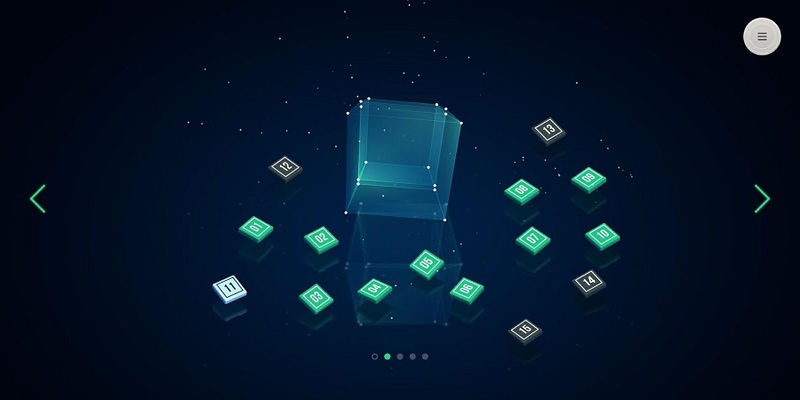 There are 15 levels spanning four different worlds, so tap on the first box to begin. This is a trial-and-error puzzle game, so don’t expect to be served up instructions or any useful hints as you play. You’re on your own figuring out how this weird universe functions. Basically, you’re thrown into a bizarre universe where you have to lead one, two or three different colored astronauts around a floating path to their corresponding exits. It might sound easy, but trust me, it’s not. Obviously, the puzzles get more and more complicated as you advance. 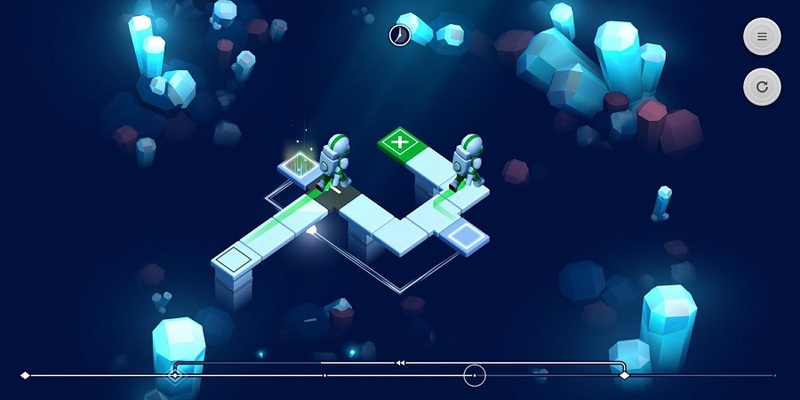 The first ten levels ease you into the whole dynamics – basically you swipe down to move time forwards and implicitly the astronauts and swipe up to rewind it. 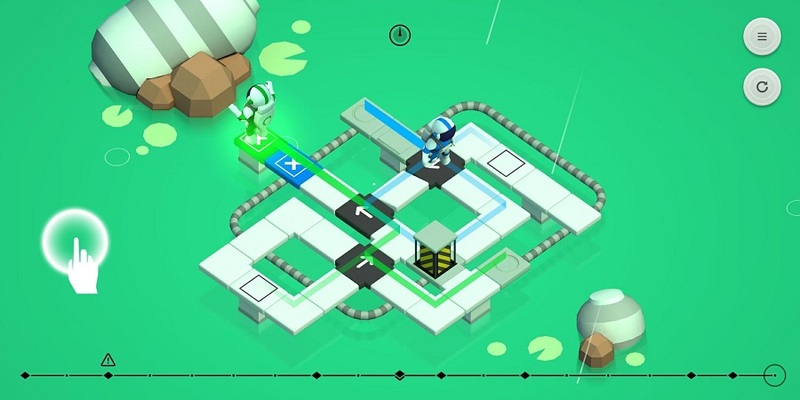 The astronauts will run along the path, but you get to control their direction by changing the arrow tiles. Tap the arrow to change the direction and make the astronaut follow the new path. If you realize you’ve made an error in judgment and sent the astronaut the wrong way, you can quickly swipe up to go back and change your approach. But there’s a catch – each level comes with a pre-set number of moves. Run out of them and you won’t be able to complete the level. The good news is that you don’t need to reset the level every time you get stuck. 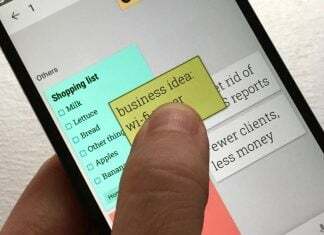 The timeline at the bottom of the screen maps down all your actions and you can rewind and fast-forward as many times as you want until you come up with the right solution. Difficulty increases as you advance to the next levels and into the next worlds. Soon you’ll stumble upon switches that raise and lower obstacles, alien tentacles, cracked floors and shadow stalkers who can devour the astronaut. When more astronauts are present on the screen, their actions will be interconnected. This means they will both advance at the same time. Also, they won’t be able to pass one another, leading to blockages. So players need to figure out how the two (or three) astronauts can work in tandem in order to reach their corresponding exits. The game becomes even more challenging when time traveling portals are introduced. These allow your astronauts to travel back or forward in time, so the past/future self and the present self can work together to achieve a goal. Once new mechanics are introduced (like the time traveling portals), you’ll play a few simplified puzzles to help you learn how to navigate the new scenario. 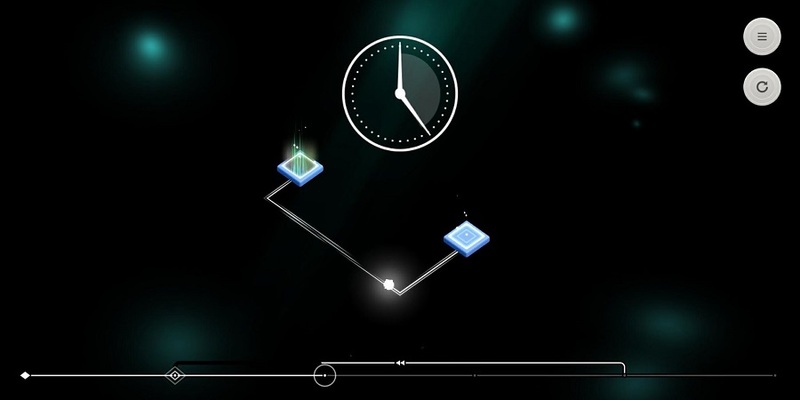 And if you get stuck on the more complicated levels, you can simply skip to the next one. This helps with keeping the player’s motivation up. That’s the trouble with Casualty. It can get extremely frustrating. The lack of instructions can also be quite bothersome, especially if you don’t have a lot of time to invest in playing. 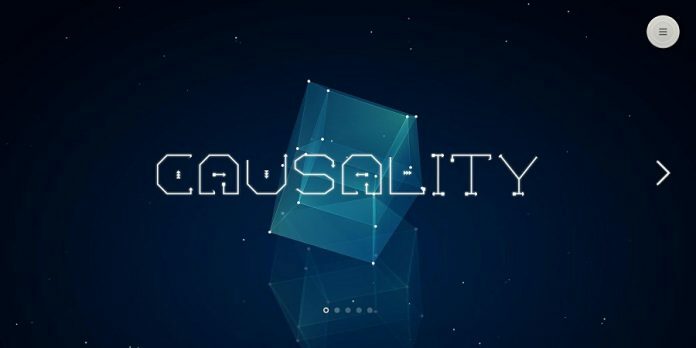 The game relies on users’ perseverance, so if you were hoping for a casual game to relax your mind and spirit, Casualty is definitely not for you. But, if you’re a competitive puzzle master, then you’ll love the mind-boggling mechanics underlying this challenging game. The graphics and soundtrack are pretty well done too. The animation is fluid, backgrounds are other-worldly and the VHS-like effects when you travel through time are a brilliant addition. The music complements the visuals very well. It’s comprised of Sci-Fi bleeps and clicks and burbling ambient noises which really sum up the vibe you get playing this puzzle game. 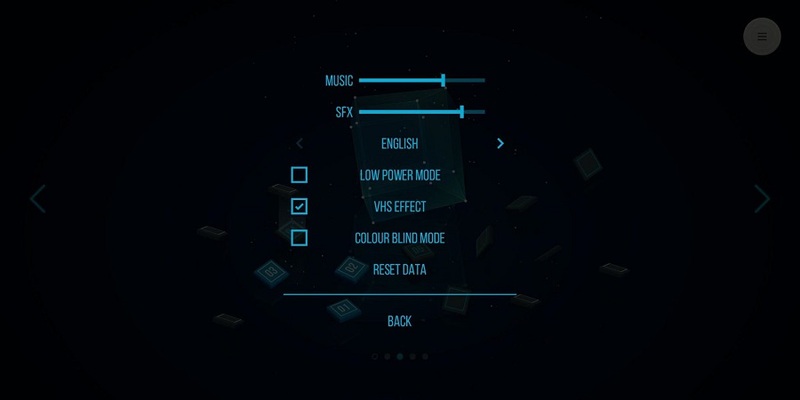 Note: There’s also an VHS effect that can be applied on the overall gameplay. Most people play games to relax, but Casualty definitely doesn’t let you do that. Instead, it will push the boundaries of your reasoning skills, while challenging you to constantly think and re-think your strategies. It’s a complex game that can very easily become annoying. The creators of the puzzle know this all to well, so paradoxically, although it’s hard, Casualty is a very user-friendly game. You’re almost never forced to restart a level completely, you can just rewind. Also once you’ve finished the first 10 levels, the next five are unlocked automatically. Even so, you have to be OK with knowing that you will spend a fair amount of time trying to solve each level. Casualty is not a game you can go through without breaking a sweat, but for diehard puzzle fans that won’t a problem at all. Causality is a mind-bending puzzle game which challenges you to master the space-time continuum.